HostPapa is a web hosting provider for small businesses. Its features include free website migration, free website builder, unlimited disk space, eCommerce carts, SEO tools, analytics, and more. We compiled HostPapa reviews from our website and around the web and determined that it has generally positive ratings. We also shared its available pricing options. Users who gave HostPapa a positive review said that the platform provides good uptime rate and website transfer service. They also commended its user-friendly and intuitive interface. There weren’t a lot of negative reviews about HostPapa, but some users complained about faulty email accounts and billing problems. A user who left a negative review of HostPapa on Hosting Review said that the business email crashes regularly. He also complained about being billed for the domain name renewal even though it wasn’t renewed. HostPapa has three subscription options for its web hosting plans: Starter (ranges from $3.95 to $5.95/month), Business (ranges from $3.95 to $5.95 per month), and Business Pro (ranges from $12.95 to $17.95/month). The main differences between the plans include the number of websites hosted, storage limits, and more. The company also runs regular promotional pricing. As of the date this article was written (9/30/2018), promo pricing ranges from $3.95 to $5.95 for the Starter and Business plans, and $12.95 to $17.95 for the Business Pro plan. What Is Web Hosting: Types & How to Choose a Web Host — You can choose among different types of web hosting based on the amount of traffic that comes to your site, the types of files you need to host, and your budget. In this article, we’ll discuss the different kinds of web hosting to help you know which one is best for your business. Bluehost vs. GoDaddy: Comparison of Price, Features & Server Performance — When it comes to deciding between GoDaddy vs. Bluehost, the differences can be subtle. Both offer a very similar array of services, and their server performance ratings are roughly the same. Learn more about these two web hosting providers in this guide. Does HostPapa offer a free trial? There was no mention of a free trial on HostPapa’s website. Interested users need to contact their sales team to know more about the company’s product offerings. Can I cancel my web hosting account anytime? Yes. However, HostPapa cannot offer a refund after 30 days from the date of purchase. The domain fee is also non-refundable. Do I still have to pay for the registration of my free domain after the first year? Yes. In the first year of web hosting with HostPapa, the company will register a domain name for you and pay for it. After the first year, you will be billed annually for the domain name at its respective price. This video provides a brief overview on the benefits of subscribing to HostPapa’s Shared Web Hosting. Not sure if HostPapa is the right fit for you? Read our reviews of all top web hosting providers or check out one of these three HostPapa alternatives. I have 2 websites with Hostpapa. Very, very, user-friendly. So easy to set up. Lots of upload space. Thought I would run out of upload space. However, it is 4 years later and there is still heaps and heaps of upload space available for images and files. Love the options to change templates and style – a great professional selection is available. One can change the style/appearance in no time – so cool! Very, very affordable. I pay just over $ 390 per year for the hosting – that is a stunning $ 34 to 36 a month – awesome value for such professional hosting with all the features in the world. I only had positive experiences since I signed up with Hostpapa about 4 years ago. The other day one of my website pages was not loading. I reported it online and in less than an hour the problem was sorted. Great support! I searched the best websites in my area, about 4 years ago. The best reviews I could read was Hostpapa’s. 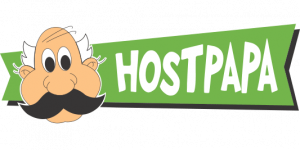 So glad I chose Hostpapa – excellent value at a very affordable price. I wish I have started a website earlier. It could have made my life so much easier. The Control Panel allows one to see statistics on the site visits with so much detail. The feedback is invaluable – love the fact that one can see the different countries visiting the sites, the downloads and more. I can plan my content better because I know who visits the websites. My next challenge is to install my WordPress blog into Hostpapa – it seamlessly connects/communicates with Hostpapa websites. Excellent reliability. I have not experienced any downtime since I started using the company in 2011. The control panel gives a good level of access to a wide range of functions. Because of this I have seldom needed to ask for assitance, and I appreciate being able to change settings myself, including loading software and using the SQL databases. Unlimited storage and traffic means that I have no worries about exceeding limits. Extra charges for automatic daily backups, with a limit on the size of these unless you pay more. Support requires the submission of “tickets”, which can take a day or two before a response is required. Online chat seems to be mainly aimed at administrative issues rather than techncal ones, but my experience of this is limited as I have not had to make us of it. Price increases significanly after the initial contract period is completed, though perhaps still comparable with other hosts. Host Papa responds promptly to service requests (tickets) – I generally have had responses within 24 hours. My requests have been handled courteously and I have never had any cause for complaint. I have been using Host Papa now for seven years and have never had any reason to switch service providers; so although I have no other company to compare with, I have been completely satisfied with Host Papa. It is important to me to support a Canadian company. I can’t think of anything Host Papa does not do well. The support when I have opened a ticket with a question or request has always been prompt and helpful. I would like to have known more about the sustainability policies of Host Papa as corporate sustainability reporting is of extreme importance as we move into a carbon constrained future. I am a complete novice when it comes to running a website. I have learned how to use FTP software and that’s about it. But I have found the people at HostPapa amazingly helpful and courteous(more so than I am myself probably if I’ve got some annoying ‘computer problem’) and every little problem or question that I have come to them with, however naive or trivial, they have solved quickly and effectively and even left me feeling that I kind of understand what I was doing wrong and won’t need to make the same mistake again. If you are a newcomer to running a website, or even if you aren’t, I think you would be crazy to choose any other hosting service. There seems to be no down side to HostPapa. Nothing that I have so far discovered. Again, nothing that I can think of.